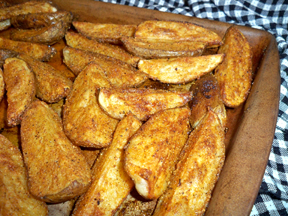 Use your favorite seasonings for these potato wedges. Serve them with ketchup and sour cream beside a big juicy burger. Who needs to eat out? 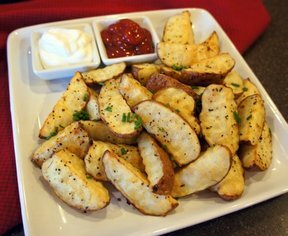 Cut potatoes into wedges. Place wedges in a bowl and pour olive oil over them. Mix until well coated. Place on a large baking sheet. Combine all seasonings and Parmesan, if desired. 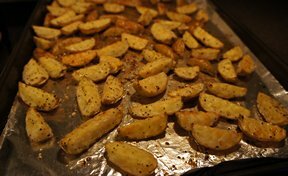 Sprinkle wedges with seasonings. "These were great next to my burgers last night. My 2-year-old loved them. 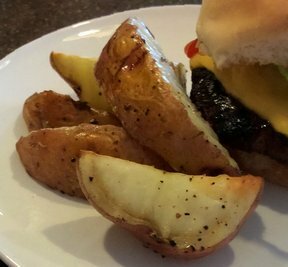 I skipped the Parmesan and used Montreal grill seasoning instead of the garlic and rosemary."